Hrishikesh Mukherjee, unquestionably one of the greatest directors that Indian film industry has ever seen redefined Hindi Cinema with his evergreen films including 'Anand' (1970). Born in Kolkata on September 30, 1922, Mukherjee graduated in science from Calcutta University and started his career as a teacher and a freelance artist at the All India Radio. His love of films drew him to New Theatres in Kolkata in 1945 where he worked as a laboratory assistant. In New Theatres he met the veteran director Bimal Roy and that association changed his entire career. Bimal took Hrishikesh under his wings and started training him as a film editor. His first film editing assignment was on the film Tathapi (1950). Before turning to filmmaking, his editing credits included regional language films like Ramu Kariat's Malayalam film 'Chemmeen'(1965). He started his career as an assistant director to Bimal Roy with the film 'Do Bigha Zamin' (1951) and it took him six years to direct his first film 'Musafir' (1957) with Dilip Kumar. The film bombed at the box office but it caught Raj Kapoor's attention who was immensely impressed by Mukherjee and recommended him as director for the film 'Anari' (1959), starring Raj Kapoor and Nutan. The film was a huge commercial success and there was no looking back for Mukherjee. His following film 'Anuradha', (1960) the story of a talented artistic wife who leaves her idealistic doctor husband and returns to her rich father's house to pursue her career as a singer and dancer, won the President's Medal. His films, which were also synonym to the melodious music covered a wide variety of genre ranging from comedy to complex man-woman relationship. He also gave one of the most popular lines to Hindi cinema with the song- 'Jeena isi ka naam hai' (Anari). Some of his memorable films are 'Anupama' (1966 -starring Dharmendra, Sharmila Tagore), 'Anand' (1970 - starring Rajesh Khanna, Amitabh Bachchan ), 'Guddi' (1971 - starring Jaya Bhaduri, Samit Bhanja), 'Bawarchi' (1972 - starring Rajesh Khanna, Jaya Bhaduri), 'Abhimaan' (1973 - starring Amitabh Bachchan, Jaya Bhaduri), 'Chupke Chupke' (1975 - starring Dharmendra, Sharmila Tagore, Amitabh Bachchan, Jaya Bhaduri), 'Mili' (1975 -starring Amitabh Bachchan, Jaya Bhaduri), 'Golmaal' (1979 - starring Amol Palekar, Utpal Dutt, Bindiya Goswami), 'Khubsoorat' (1980 - starring Rekha, Rakesh Roshan)etc. Some of these films, have shaped the careers of several top actors like Amitabh Bachchan, Rajesh Khanna, Dharmendra, Rekha, Jaya Bachchan and Amol Palekar. While 'Anand' was a masterpiece, 'Chupke Chupke' (1975), 'Golmaal' (1979) and 'Khoobsoorat' (1980) are considered Bollywood classics. But post 'Khoobsoorat' his career headed downhill and he made a futile attempt to revive it with 'Jhooth Bole Kauwa Kaatein' (1998), starring Anil Kapoor and Juhi Chawla. Besides direction he also worked as writer for 15 films, including Namak Haram, Abhimaan, Bawarchi and Guddi. He has won the coveted National Award for his film 'Anuradha' (1960), Dadasaheb Phalke award (1999) for lifetime achievement in cinema and Padmavibhushan in 2001. Apart from filmmaking he served as Chairman of the Central Board of Film Certification and the National Film Development Corporation (NFDC). 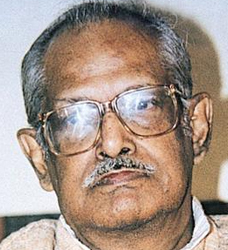 In August 27, 2006 Hrishikesh Mukherjee passed away in Mumbai after a prolonged illness. He is survived by three daughters and a son. His granddaughters Tapur and Tupur Chatterjee are well-known models.